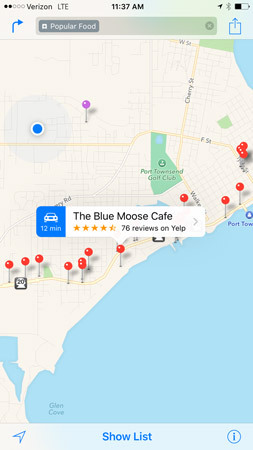 The Maps app on your iPhone has lots of useful functions. You can find directions with suggested alternative routes from one location to another. You can bookmark locations to return to them again. And the Maps app lets you get information about locations, such as phone numbers and web links to businesses. You can even add a location to your Contacts list or share a location link with your buddy using Mail, Messages, Twitter, or Facebook. New with iOS 9 comes the Nearby feature to explore local attractions and businesses, and the Transit view for public transit maps for select cities around the world. When you perform a search, a row of buttons is displayed across the top of the results. These take you to Nearby results; that is, businesses and services that are near your current location. Begin a search and tap one of these buttons, such as Fast Food. You see results for the Food category. 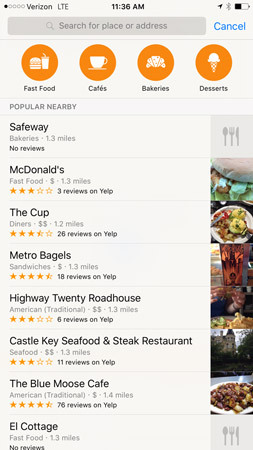 These results offer additional buttons that help you narrow the type of food you’re looking for, as well as a list of nearby restaurants. Tap an item in the list. A map of all results in that category, including an information bar for the item you selected, is displayed. Tap the information bar for the location you selected to display more information about it.